Local authorities are much better now at preserving historic buildings and places. It used to be that anything more than 50 years old was likely to be knocked down in the name of progress but the situation is a little better now. 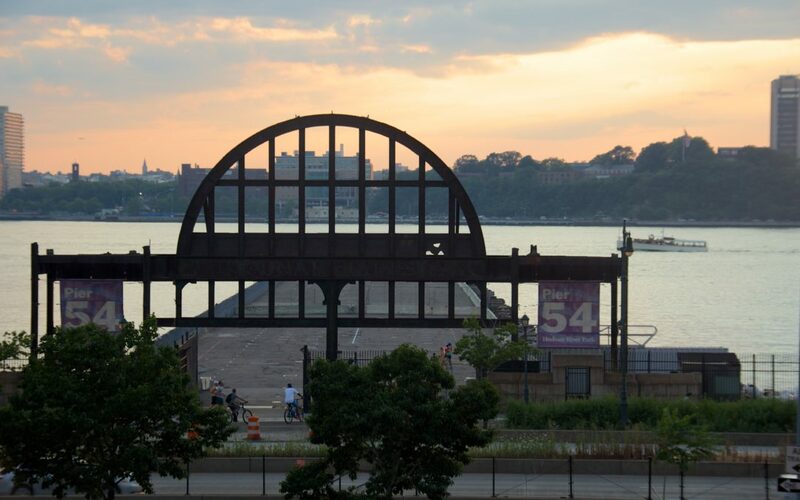 But Pier 54, with a curious maritime history, has an as yet undecided fate. The empty and derelict pier is now part of the Hudson River Park and its future is unknown. Yet it played a part in two – coincidentally – major maritime disasters in the last century. If I say that the first of these disasters took place in 1912 and the second in 1915 then the chances are that you’ll know what I’m talking about. Yes, both the luxury liners, the Titanic and the Lusitania have connections with this pier. If you’re thinking ‘but the Titanic never made it to New York’ then of course you’re absolutely right. But it’s where thousands of relatives, plus newspapermen of course, gathered once they heard that survivors had been picked up and would be transported to Pier 54. As we know, when the Carpathia docked, many of the people waiting in the crowd were disappointed – there was only a relatively small number of survivors. The public had been misled. Initial reports had implied that the Titanic had survived the impact with the iceberg and was being towed into New York. It also was believed at first that there had been no casualties. In fact, it was another four days before the full extent of the tragedy was known. The Carpathia hadn’t arrived into New York until the 18th April. Just over three years later, The Lusitania, another huge luxury liner, left Pier 54 on its voyage to England. It nearly made it. In 1915, England was heavily engaged in the Great War and shipping had been warned that German u-boats were patrolling the coastal waters. The Lusitania was just off the coast of Ireland when she was hit by a German Torpedo. There were 1198 people who didn’t survive. No one knows what’s going to happen to this historic site. Various plans have been suggested over the years but not have come to fruition. See Pier 54 before it becomes disneyfied, I’d suggest. WHERE IS THE HUDSON RIVER PARK?